The first step to building a new apartment development is to acquire the land that it is to sit on. These days, this process is both easier and more complicated. As cities throughout Canada embark on intensifying their urban cores, land which was deemed surplus to development can now be a gold mine for the owners occupying it. The Greater Toronto Area alone expects to add as many as 100,000 new residents per year, and have sought to increase residential densities along major transportation corridors and nodes such as subway and commuter train stations. Even though cities have started to encourage increasing densities along major corridors, there are several steps landowners and developers must take in order to realize a plot’s potential. The first obstacle is that the landowner and the developer are not always one in the same. While property owners may realise they have excess density they can profit from, they may be experienced only in managing their shopping centre or apartment building and they may not have the necessary experience to navigate the complicated rezoning procedures or the task of building on the freed up land. A developer may have a strong concept of what to build on a property, and the experience to make the project happen, but he or she still has to find the land upon which to build and must get in touch with the owner in order to buy it. Finding the right property on which to build, or finding the developer to build on it, often requires a third party who knows how to negotiate the complicated process of changing by-laws, conducting feasibility studies, and gathering the right builders. It is a rare landowner who has all the expertise he or she needs to develop his or her excess density from the ground up. A successful development often has multiple partners. There are many ways to realize the intrinsic value of excess land depending on who the owner is and their development expertise. A landowner could retain a consultant such as a planner or an architect or a municipal lawyer to contact the city and ask for a rezoning. He or she would then have to decide whether to sell off the excess density to a developer or try to develop the property themselves. They may decide to do a joint venture with a developer in order to realise the full value of their new asset. If the property owner is not comfortable with doing a joint venture, then they may want to just sell off the land. Another approach a property owner might take is to get a developer involved earlier, doing a deal subject to rezoning, and then letting the developer handle the rezoning negotiations at his cost. This often leads to better results, as a developer is usually experienced in dealing with city planners and understanding what is feasible for a particular plot of land. In any municipal development, there is a lot of negotiation between the city and various stakeholders (including the property owner, and owners of nearby properties). Developers who have a lot of experience in building within a city have an advantage in these negotiations, as they have a track record that municipal officials can look at in determining what is feasible. Municipal officials know that if a developer has come to them with a strong track record, they are more likely to build what they are planning to build. A single property owner with no development experience asking for a severance is less likely to have a clear vision of what to build or how to build it and is more likely to sell the severed land to a developer who may or may not like what was negotiated between the property owner and the city, thus requiring further negotiations when the developer comes back to the city to change what was agreed to. The best way for a developer to get the best value for any land he or she buys is to have a strong idea of what he or she wants to build on that land before he or she buys it. Only by carefully analysing the local market can he understand what type of development will generate the best investment. It may be that a less expensive plot can be purchased elsewhere which will generate similar returns. 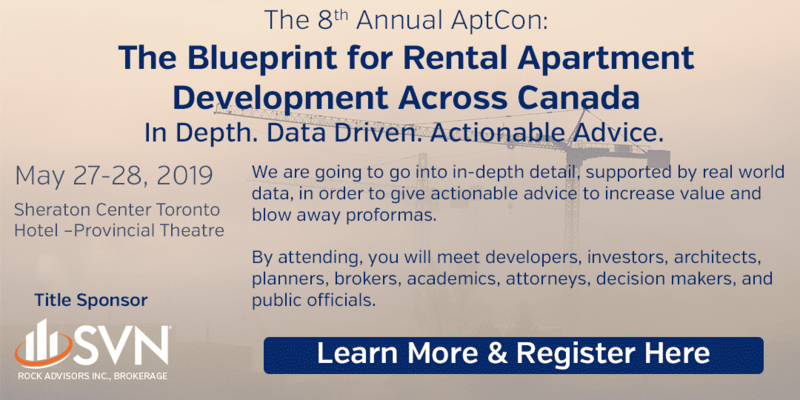 This is particularly important since new apartment developers are already in competition with new condominium developers, who are already scouring Canadian cities looking for excess density on which to develop. Land costs have already increased in the past few years, but a developer or a property owner who has a clear idea of what to build and where, who has pulled together the best data or who has been introduced to the best development partner, has the potential to reap considerable rewards for land which would otherwise lie fallow.